Memorial Day weekend signifies for New Englanders that the vegetable garden is ready to plant and the window boxes are safe to decorate with tender annuals. For the hardy gardeners that brave unpredictable spring conditions, a sigh of huge relief comes over all when we hit this home stretch. This is the busiest time of year for planting. The frenzy strikes and everyone, including non-gardeners jump in the game. It’s time to purchase those pretty hanging planters or take a chance at a few tomato plants. Because there will be plenty of time to chat this week about our gardens, let’s switch gears to cooking. Sometimes by adding one ingredient, often by mistake, you can make an already beloved recipe something spectacular. This favorite delectable is not regionally grown so we must break the rule of ‘buy fresh, buy local.’ Simply put, Artichokes are the Filet Mignon of the vegetable world. A member of the Thistle family, Artichokes can be prepared a number of ways. 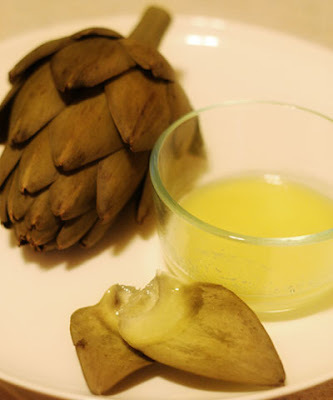 One of our favorites is to steam and dip the Artichoke leaves and heart in drawn butter. By adding one tablespoon of freshly squeezed lemon juice to a half stick of butter, you can kick the flavors up a notch. It introduces zip and zing to savory. It sounds fattening and it is, but Artichokes with butter and lemon are heavenly. Skip this week’s ice cream and try this recipe. This is peak season for Artichokes. Your grocery stores should have a great selection to choose from and you can’t beat the price. This vegetable served steamed is not geared for the annual cook-out so try it out before all your guests arrive with the hot dogs and hamburgers. And for all my Sterling readers, don’t forget to exercise your freedom to vote in your local elections today. Polls opened at 7:00 AM and close this evening at 8:00 PM.